So, let’s talk about the question — can blogging work for anybody, any business, anyone? Let me just say, you’re asking the wrong question. Now you may be saying, “Wait, hang on Jon, it’s your show, it’s your title, you asked the question.” But, what I was doing was asking a question that I have been asked more than once. Now if you are saying that, what you’re looking for is an excuse not to do it because you’re obviously not doing it. So if you want to know, can it work for everyone, you want to know why it won’t work for you, why you don’t have to do it and why can get on with not doing anything like you’ve been doing before. So, it’s nothing to do with blogging. Let me explain, and sorry for being so tough but sometimes you need to have a bit of tough love to get the message across. Blogging is not a thing; blogging is a method of communicating with your customers, of putting your message out there online. Online is everything. Yes, there is off-line, yes, you still have to talk and yes you have to visit customers and yes, you have to deliver your goods and yes, you have to perform your service; but where do people look? For example, we recently had Black Friday and Cyber Monday? We don’t do Thanksgiving, so Black Friday means nothing to us, except cheap stuff that we were going to buy anyway and we’ll buy in November so you stores sell nothing in December, because that’s when we were going to buy it anyway. Black Friday last year, they were little fights and things in stores such that the UK version of Wal-Mart, which is called Asda, has stopped doing it. They were one of the ones that introduced it, they didn’t participate at all this year due to the horrible scenes and the bad media and the publicity. But all the others were geared up, they had security guards they had all special ways of doing it, but what happened on Friday, nobody was in the shops. And trust me, I went and did my shopping and they were completely empty, there were probably less people in the shops than on a normal day. Because, where were they? They were online, they were buying it on the Internet because the same offers were on the Internet. Why visit anyone when you can sit there in the laziness and the warmth of your own home and do it on the Internet? This is what is happening to your business. I’m not saying you have to have an E-commerce store and sell everything online, but this is where people are researching, this is where people are finding out about you, checking you out, they are taking on social media. If you are not online, you are not. And that’s it, you are a non-entity, you are dying a slow death and online generally means blogging these days. For most businesses who don’t have an e-commerce store, you need to put out content. Don’t go to a local marketing company and order a website, they haven’t got the faintest idea of how to market online. They know how to build a nice looking website, but that’s not what is, that’s like putting together a nice brochure. What do you do with it then? If you sit them in your office and wait for people to come in and ask for one, you’re not going to get very far, that’s what you have unless you are actively updating your website. So it doesn’t matter whether you are a painter and decorator, whether you sell fire safety stuff, whether you are a car dealership, whether you are a charity, it doesn’t matter, people want to know about the services you do. First of all, they want to know about the subject that you are in the industry of, then, once they have researched and found out everything they need to know about that, then they’re going to drill down to individual players and look them up. So, when they look for that information, how about your information on your website or your blog is the stuff that comes up? You are instantly an expert, instantly you’ve got the authority, they instantly think you are brilliant, so they’re going to look at, now they are going to look at your “About us” page and then they are going to read some more content. And for all of you that think that people don’t have a lot of time and they won’t spend time online, yes they will, they will read. If you have got information, they won’t need to go anywhere else, they will read page after page after page if they are interested. If they are not interested, they won’t read page after page after page of any one site. But those that are looking to make decisions and are looking for that service will read more and more and more. There are plenty of instances of people that have read 20 and 30 pages off someone’s site, maybe not in one sitting, maybe they come back, maybe they do it at another time. But if you are not blogging, you are not there; all your competitors are getting all those results. Now you may say, “Well, none of my competitors have got a website.” Well, get yours up there then. What’s your excuse? Quick, beat them. Do you really think none of them are thinking like this? Do you think none of them are watching this video or listening to this on iTunes? They may be and what if they beat you to it? What are you going to do with then? You are going to sit back and think, “Ah, you know, I should have done it. I was going to do that, I knew I should have.” Do you want to be that person? So, the message is not does blogging work for any business? 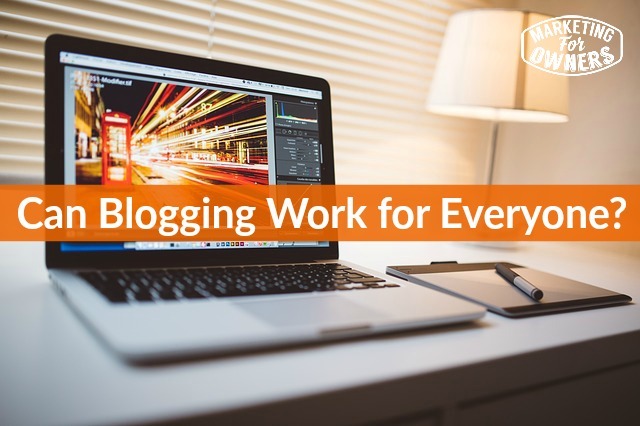 Blogging is a state of mind, blogging is informing the world about your business, your industry, your trade, your expertise about what you do, about teaching them about informing them about putting yourself out there. If you’re blogging, you are likely to be on social media, you are likely to be on e-mail, you are likely to be light years ahead of your competitors, so get to it. How often do you have to do it? You don’t have to blog every single day, that isn’t what it’s about. Quality, if you’ve got nothing to say, don’t say it. If you’ve got little to say, say it on social media. On your blog, that is the hub of your marketing system. If you think, “I haven’t got a blog, I don’t know how to do it”, go to our site, go to www.website101.co . Go there, read that, see it, our product has a full money back guarantee, absolutely. Did someone say that before? I’ll give you your money back if it doesn’t work. How about that? Anyway, if you can’t figure it out, if you’re not quite sure, e-mail me jon@marketingforowners.com, I will reply, I will reply personally. If you’re not convinced, I will jump on Skype or phone you, wherever you are in the world and I will talk to you about it, there is no charge for that. I want you to succeed; it’s as simple as that. And by the way, I will explain about the product, if you still don’t want to buy it, you don’t have to, it’s very cheap. “Cheap” the wrong word? That’s not the marketing word, is it? Anyway, you know what I mean, or it’s very effectively low-priced. But, e-mail me, talk to me, I will answer all of your questions. I have been there, I do this, this is how we do it. Can’t get fairer than that. 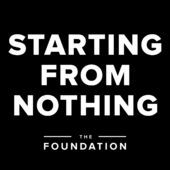 It’s Thursday and that means it is time for drive time podcast and we are talking today about a gentleman called Andy Drish, and his podcast is called Starting From Nothing. His website is thefoundation.com. I think he’s got a bit of a personality clash there. He talks to businesses, to entrepreneurs, people like you who started from nothing, from scratch, as he says no silver spoon, no magic bullet, nothing. What did they do? Some of them didn’t even have an idea of what to do. How did they get started? What did they do? How did they hustle? How did they get to where they are today? No I saw Andy speak in Washington I think, probably about three years ago; he’s young, he’s enthusiastic, he is very very good. I suggest you go have a look. I think they do a video version on the podcast as well on the actual website.